Minmi was a small herbivorous quadrupedal armoured ankylosaurian. In 2016, Gregory S. Paul estimated its length at three meters, its weight at 300 kg (600 b). For an ankylosaurian, Minmi had long limbs, perhaps used to quickly search cover under brushes when threatened by large predators which might have been able to flip the small animal on its back. Unlike other ankylosaurians, Minmi had horizontally oriented plates of bones that ran along the sides of its vertebrae, hence its specific name, paravertebra. Molnar in 1980 acknowledged that these were ossified tendons, but denied that they were homologous to the ossified tendons of other Ornithischia and claimed that they resembled the pathological tendon aponeurosis of modern crocodiles. Victoria Megan Arbour in 2014 deemed this unlikely and could find only one autapomorphy in the holotype: the high vertical extent of the musculus articulospinalis tendon ossification at its outer front end, wrapping itself around the side process of the vertebra. In 2015, Arbour and Philip Currie concluded that even this was not unique, which would mean the holotype had no diagnostic features and Minmi would be a nomen dubium. 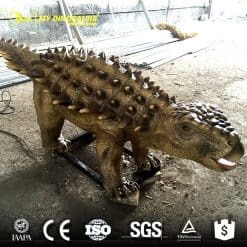 However, the 2015 description of Kunbarrasaurus announced that new distinguishing traits of Minmi had been discovered and that it should be considered a valid taxon.